Time and time again, new installations of Out of the Park Baseball never cease to amaze. March has come around once again. With real life baseball players reporting to camps and playing games for this year’s Spring Training, baseball season is looming. This means a new installment of Out of the Park Developments premiere franchise, Out of the Park Baseball, a franchise long storied as one of the best when it comes to text-based GM games. Coming new with this year’s version of OOTP is the improved home screen. OOTP 17 reduces the text of the old version and condenses them into eight visually pleasing buttons, with the settings right below them. I cannot stress enough how much of a minor yet incredible change this is, as it makes the home screen look that much better and simple for the eyes to view. Returning as well is the loading screen quotes. Being greeted by various quotes and facts about the MLB is always pleasurable, and it is a nice touch for the loading times. Loading times this year have been vastly improved, with the game now able to run on multiple cores of your CPU, thus allowing it to run faster. This is a major improvement for the franchise, and one that is frankly about time for the game to have. However, I’m not complaining about that, because allowing the game to process on multiple cores makes the loading time much quicker, allowing you to jump into the meat of this game faster. A major feature of this year’s OOTP is the brand new Historical Exhibition mode. What this mode allows you to do is pit any two MLB teams from any era of baseball history against each other in a series of games. Want to see what would happen if the 1927 Yankees played the 1975 Cincinnati Reds? What about how your favorite team stacks up against the 1969 New York Mets? Now you can find out, in a feature that has been implemented very well. When set up, it functions like a basic series sim, but it is a feature that is much appreciated nonetheless. As a fan of playing historical games in OOTP, the new feature of complete minor league rosters is massive. Regardless of whether you enjoy playing these or not, it adds a level of depth to historical games that was desperately needed, making historical games on the level of reality that current day games carry along with them. 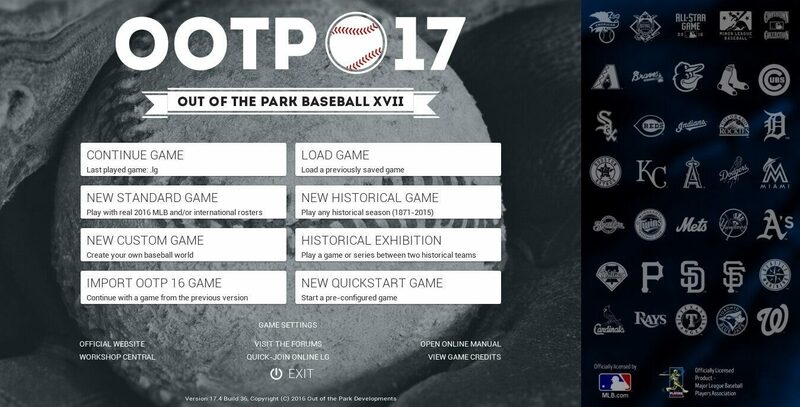 As soon as you launch the game and it finishes loading, you are taken into the complex world that is OOTP. At first it will be confusing, but once you learn how the menu works, one will realize how much of a mastercraft the OOTP interface is. Everything in the game is organized in neat ways, and set up in a way that I always find myself discovering features I didn’t previously know existed. 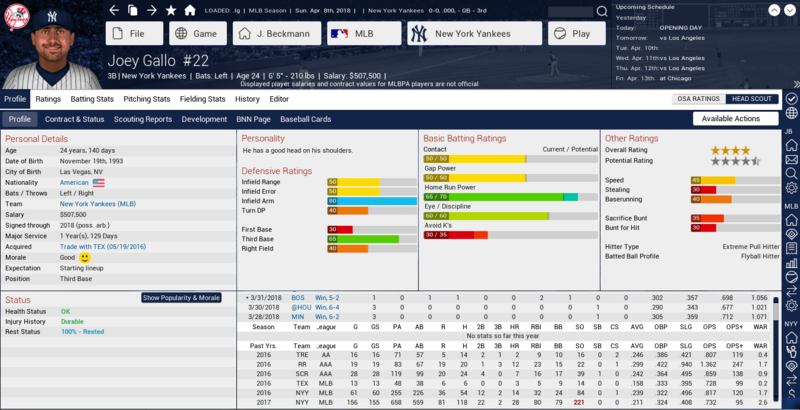 OOTP 17 has added a few new settings, one of those being the ability to customize whether you want to be able to trade players who have less than seven days left on their injury. It’s small additions like these that make me love the franchise, as there are always new things to find and explore in the game world. One of the things I’ve always loved about Out of the Park is that if you want to, you can micro-manage your team, choosing what you want your pitchers to do, and for what you want your batters to do. I personally don’t do this, but when I have done so, I found it added a whole crazy new level of strategy into the game. 17 furthers this feature, and it still works in a wonderful way. When you micro-manage games, there are three different views. One of those views is 3D. What 3D does is sort of animate sticks to resemble players, and you see the ball get hit and the players throwing it around until the end of the play. It’s a neat feature, one that has been fun to use but flawed in some places in past versions. In 17, however, I have noticed no flaws in the 3D and the functions surrounding it. This is great for those who enjoy it, and it removes a problem for the most part that has been an issue in the installments since the feature was introduced. Trading and free agency are two categories in which I have minor gripes about this year. A new addition to this year’s game is the ability to set team needs, after which teams will offer you deals based on what you set. Whilst it can be appreciated as a feature, it is one that adds even more ridiculous trade offers, even more ridiculous than what has become the norm with OOTP. It’s disappointing, but it leaves room for a feature that can be fleshed out in future versions. Free agency also has its respective issues, with some players demanding too much money. This is a problem, as it often leads to them not signing for long periods of time, often until Spring Training, where they take one year deals for much less than their value. Nothing takes you out of the realism more than a 35 year old Jose Bautista demanding a near 140 million dollar deal over four years. It’s a tad ridiculous, and this disparity between demand and value is easily the biggest flaw of this year’s game. As per expected, the draft is back in full swing in OOTP 17. There isn’t much to say about the draft, as it is already a stellar feature that I feel is often unappreciated. The realism of the talent generated has always been a plus, as the fictional players often mimic an actual draft class in terms of skill. For the first couple years, the draft class features players who actually exist in real life, which is neat to see, but after that, it goes full fictional. After all, OOTP can’t predict players to be good enough to MLB before they are even born. Either way, the draft remains a stellar feature in OOTP, and when draft time comes around each year, it is just as fun to do as always. 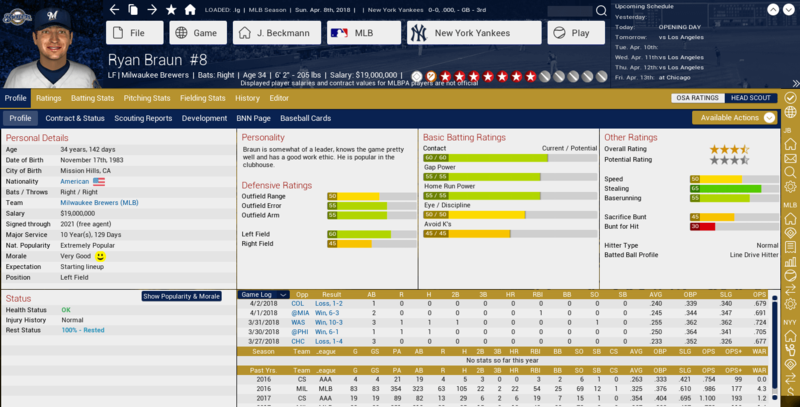 Player progression is another aspect that has been changed in OOTP 17, as it now takes impact from trades, injuries, team performance, and things regarding to those guidelines. This is supposed to be a way to add realism to the way players progress, taking into account their every move and using it to determine the arc of a career. This is one of the underappreciated features, one that is not easy to tell from the outside. There is no way to truly tell what this feature does to a game, but I have personally noticed the effects on some players who are injured often, or those who bounce from team to team. Whilst it might not be noticeable for the average player of this game, it adds a hidden level of realism to the game that can be appreciated on a deeper level. Perhaps the most radical change of OOTP 17 is the overhaul of FaceGen. Remember all the times of faces that were generated in which the face didn’t match the player at all? That is no more, as for the first year ever, Out of the Park is licensed with the MLB and the MLBPA. This allows for players to have actual faces. This adds extreme realism levels, and it fills a need to generate random faces for all the players you recognize from real life baseball. 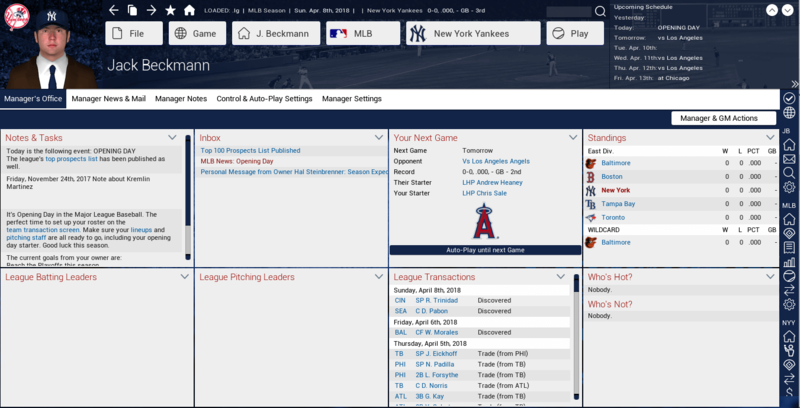 The MLBPA license is an incredible get for OOTP, and it allows for the game to be that much better. When it comes to general manager games, Out of the Park Baseball takes the crown for level of quality. The amount of realism, replayability, and customization the franchise offers is matched by none in this genre of game. Out of the Park Baseball 17 takes this throne and improves on it, adding features that greatly enhance the quality of the game. The result is an extremely well-rounded product, one that has its minor flaws, but one that remains at the top of the genre of general manager games.